Even though he still has another year of team control remaining, superstar first baseman Paul Goldschmidt – a Diamondback since they chose him in the eighth round of the 2009 draft – may be in his final days with the club. While the path the Diamondbacks will take during the offseason is uncertain, general manager Mike Hazen hasn’t ruled out a full rebuild. Arizona’s in a bind in terms of payroll, as MLBTR’s Steve Adams explained earlier this week, and set to lose two of its best players to free agency in left-hander Patrick Corbin and center fielder A.J. Pollock. 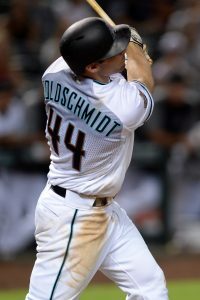 In the event those factors do lead to a teardown in the desert, the logical move may be to at least gauge interest in the 31-year-old Goldschmidt. USA Today’s Bob Nightengale reported earlier this week Arizona will indeed “listen on” Goldschmidt, as dealing him would help restock a barren farm system which Baseball America (subscription required) ranks as the game’s fourth worst. Between the free-agent and trade markets, Goldschmidt would easily be the premier first base option available. As MLBTR’s Jeff Todd wrote Wednesday, there don’t seem to be any starting-caliber first basemen set to reach free agency, while all of Goldschmidt’s fellow trade candidates at the position pale in comparison to the six-time All-Star. Those factors – not to mention Goldschmdt’s affordable salary (he’ll play 2019 on a $14.5MM club option) – would likely lead to widespread interest. 2019 will be the final season of the six-year, $46.5MM extension (including the option) he inked with the D-backs entering 2013. The decision to lock up Goldschmidt before he turned into an elite player will go down as one of the best in franchise history, given that the pact has been a steal from the get-go. He broke out in earnest during the first year of it, turning in a 6.0-fWAR campaign, and hasn’t really slowed down since. Now coming off a 5.1-fWAR season (the fifth year of at least 5.0 fWAR in his career), Goldschmidt’s facing an uncertain future for the first time since signing his team-friendly contract. The D-backs may well keep Goldschmidt through the winter and try to extend one of their all-time greats, regardless of whether they expect to bounce back from an 82-win season in 2019. But if the team doesn’t think it’s going to contend in the near future, or if it’s simply unable to come to terms with Goldschmidt, we may have seen the last of him in a Diamondbacks uniform. Only has 1 year remaining so i doubt he will comand a huge hall. Team trading for him will also have to have funds to extend him. I would imagine the team that trades for him this offseason will probably have the extension agreed to with his agent. Considering his low salary this year it should be a decent AAV for the team signing him. Goldy has been on an INSANELY team-friendly contract for years. Frankly, I’d be shocked if he doesn’t make it to free acency. He deserves to cash-in. He likes money and doesn’t want to play for 2-3 different teams in a year. 14.5 M owed for 2019 < New extension @ 20-24M in 2019. Yes he does like money which he will get more of if he goes to the open market and is allowed to field offers from all 30 teams. The Cardinals have a stable full of young pitchers in the minor leagues. They also have the money to extend Goldschmidt. However, I wouldn’t think the Cardinals would sign him but for 3 or 4 years. Probably 3. Goldschmidt may want more years than the Cardinals should give him. I would love to have Goldy on the Cardinals!! Would Carpenter get moved to third? I don’t know about backing up trucks, but Goldschmidt on the cheap for a year is worth something. There’s what, 30m of surplus value there? Maybe a top 25 prospect and a back end top 100 prospect from the right team. Lol you guys actually think he’s getting traded? It may be the smart thing to do but there’s no way they do that to the fans after a year in which they only missed the playoffs because of a bad month and a half. There’s a chance he gets traded, and it actually would be a smart move by the franchise…for the long-term happiness of its fan-base. The DBacks are losing pieces this winter, and the Greinke contract hurts their ability to replace those pieces. They can hold onto Goldschmidt and hope they’re able to swing some magic in 2019, and then if not flip him at the deadline for whatever they can get if they’re not, but Goldschmidt is more valuable in the offseason than during the season due to the qualifying offer. A team can trade for him knowing they’ll at least be able to get a draft pick if they don’t resign him, helping alleviate some of the pain of the prospect package. A mid-season trade negates that, and hinders his value. A trade makes the most sense. I doubt they are gonna trade him this offseason. They will probably try to contend and then trade him at the deadline if it isn’t working out. This would definitely be true if they were returning the same team. But there’s a relatively good chance they lost Pollock and Corbin. Buchholz is also a free agent, and that seems minor, but he posted a 2.01 ERA and 3.2 WAR in 16 starts. He’ll be the easiest to re-sign, but the peripherals suggest he won’t put up anything close to those numbers again. There’s more questionable players, too. Greinke is another year older (35), and the oft-injured Peralta managed to avoid injury all season and put together the best offensive season of his career. It’s possible they put together some magic. But given all those problems, it’s hard to imagine them being as good a team as they were in 2018, and seems more likely they’ll finish just above the Padres than they’ll make the postseason. I agree that it might not be smart to trade him this winter, but I’d be very, very surprised if Goldschmidt is still with Arizona at the deadline. Arizona usually gets off to a hot start. I’d think they’d be aroun .500 by the deadline and hold onto him. I don’t think the Dodgers will be as good next year and neither will be the Rockies. I don’t know. Turner is the glue of their lineup, and he’s aging and it’s becoming more and more questionable whether he’ll stay healthy. I agree, when Turner is there, they are the best team in the West. Without Turner, the lineup seems like a hot mess of solo homers and strikeouts. And the Dodgers really didn’t have the worst luck in baseball. As far as Injuries go, the Giants had it worse. Panik, Bumgarner, Cueto, Samardzjia, Belt, Strickland, Smith, Duggar, Longoria, all missed significant time to injury. i don’t think any team had worse luck than the Mets or the Angels. Worst luck? They had a career AAA player hit over 30 Homers… they had a rookie pitcher pitch like cy young, they had bench players have career years, they had Kemp act like he was in his 20’s. Wish we had your luck. Hey stripes. The angels and Mets have had the worse luck with owners who don’t know how build an organization so they inevitably cave to pressure and sign stupid contracts. The fans who would be outraged by it are the fans that will be back as soon as the team is good again, so they’re the ones the front office has to ignore when making these kinds of decisions. I don’t know if they’ll trade him. Obviously you never want to trade a player like Goldschmidt away. But, trying to keep the window open one more year when the writing’s on the wall is how you end up where the Royals are now. I’m not even sure the Dbacks get a “haul” for Goldschmidt. First base isn’t a premium position. Goldschmidt has 1 year left on a contract and there are other trade options, such as Jose Abreu, which would probably make more sense to organizations considering the Dbacks would be selling high. I don’t think they would get a crazy return. I think they should just spend the remainder of the money they have and go for one last year of success before entering a rebuild. How many first baseman are really better then him? Maybe a few. It doesn’t matter. Teams have gotten smarter. They’d take Abreu over him if it means they don’t trade a certain prospect. I don’t know any teams that are extremely desperate and would give a haul for a rental first baseman. Shortstop or SP? Maybe a different story but not for a first baseman. Depends. There are teams out there that need a guy like him. There are teams that have a guy waiting to take over but need a year to bridge. Just like any position. He is a premier hitter and defender. He’s an average defender with a plus bat. I think that fits the criteria of a good first baseman. Goldschmidt was really bad for most of season. He hit like 200 till august when it didn’t matter there season was over, I dought they find any team that would take his contract. 1.199 OPS in June, .950 in July, 1.108 in August. June NL Player of the Month. Even if you love baseball, sometimes it’s better to just sit back and not contribute an unfounded, weird opinion to the discussion. And as far as ‘taking his contract’, I don’t know which prospects might be moved for the guy, but every single MLB team would pay that salary to have him. Well said. It literally takes a few seconds to research before you post. Paul had a bad month of May and a eh September. Other than that he hit well for average with a .900+ OPS the rest of the months. Could fit on the Cubs. Cubs have some pitching prospects. Have Goldschmidt play 1B, move Rizzo to 3B, move Bryant to LF, Move Schwarber to RF, Baez moves to SS, Contreras moves to C, Almora/Zorbist/Heyward/Happ compete for CF, 2B, and RP spots. When was the last time you saw a left-handed 3B? Ok, Jerry! How do you suppose we reverse the symmetry breaking of quantum entanglement in this dimension? As a Dbacks fan, it would be extremely upsetting for him to be traded, only because we only missed the playoffs because of *ONE* bad month. I don’t expect to tear it down only because we’re losing Pollock and Corbin. I get that we probably can’t beat the Dodgers, and if that’s the case, trade Goldy at the deadline. But at least try to compete because I think we still can. The Dbacks played .500 baseball one month, and had TWO months of 8-19 ball (games early in the season count just as much as games in September, as they say). The Astros, Red Sox, Yankees, Indians, Cubs, and Brewers never had a sub-500 month, and the teams that did (Dodgers and Braves, once each) are arguably built for very sustained success. I didn’t mention the one-month-under-.500 Rockies, because they did what the Dbacks tried and failed to do (sneak into the playoffs, immediately don’t fit in). But now, adding 50 games of Jarrod Dyson? 140 games from Souza? Giving AAA-Owings a bigger role, while losing AJ and Corbin and relying on Shelby Miller? That’s not how this team will have its next successful season. Trading Goldy is the best bet, but even if you extend him, you’re waiting for the NEXT window instead. Not sure how it’s got “Cards written all over it”. If the Cardinals were to trade for him, then Carpenter has to move back to 3rd and no one wants that…except their opponents. I wouldn’t mind carpenter at 3rd if we had Goldy at first, Wong at second, and Dejong at short. That’s 3 well above average/elite defensive infielders and then one below average with carp. In over 4000 innings at 3B, he’s a -3.8 UZR/150 and a -2 DRS. It’s not good, but it’s not aweful either. Basically, I still think adding Goldy and moving carpenter to 3B drastically improves the Cardinals. Only team I’d think of is the Cardinals but I don’t think they would be willing to let go of guys like Bader or Reyes for a rental, and I’m guessing those types of players are what the dbacks would ask for in a trade for Goldy. The best offer they’d give would probably include Weaver and Hicks, but even then I don’t know if they’d do that. Mets and Mariners don’t have the prospects. Try again. I mean, the question was who has the need, not who has the prospects to get him. Sure they do. A first baseman who can be a free agent in a year isn’t going to cost all that much. It might cost their top organizational prospects but they could get it done if they wanted to. “Who has the pieces and need” I think you forgot to read pieces. With 3 or 4 (depending on your publication of choice) top 100 prospects. Plus a rotation that could dangle a piece the Mets have enough to deal for just about anyone. Granted they need a GM first but Jeff and Fred are always looking to punch pennies and grab headlines. Yankees have a deep farm system. A 1st baseman in Bird to send away as a piece. These 2 teams match perfectly for a trade. Voit is virtually free and he has earned a long look. The Yankees are not looking at Goldy, with a possible exception if they don’t get Machado or Harper. Dodgers seem in on everyone, and Bellinger plays a pretty credible outfield. Red Sox? Definitely fits Dombrowski’s MO, and they arent getting much from 1b. The smart thing to do, if they do rebuild like they need to, is trade Goldy. That said, unless they can also unload Greinke, then trading Goldy won’t be enough. They’ll have to eat quite a bit of Greinke’s remaining salary to get anything decent in return, but in a rebuild, that’s not as problematic. The sticking point with getting a lot with a Goldy trade is two-fold. 1.He only has 1 year of control left. So trading him in the off season is better for Arizona. 2. He’ll be in his 31 age season. We’ve all witnessed the way teams are trending younger, on purpose,.So even though he’ll still be in his prime next season, a few teams that might consider trading for him will look at that as a negative. Mainly because, if you are going to give a haul for someone, you’d most likely hope to extend/re-sign him. I don’t expect him to be traded but the future is not bright in Arizona, might as well take advantage of Goldy’s value possibly being higher than it ever will. Braves get: Paul Goldschmidt, Zach Grienke, & cash. This is asinine and Freddie Freeman says hi. You missed the part about seeing if he can play a possible LF, freeman stays at 1St, goody goes to left. The reality is the West will be wide open next year. Rockies wil lose some pieces, Dodgers will lose some pieces, Giants are a wild card, Padres will still be bad, and then there’s the Dbacks who have a chance if they spend in the offseason. Yanks should do a mega deal for Goldy(extended), Robbie Ray and Greinke. Followed by FA Corbin. That’s around 16 +WAR. Dbacks would get 5-8 prospects and a massive chunk of salary off the books. Would be funny to see something like that. If Goldy were willing to sign an extension the Diamondbacks wouldn’t consider trading him for even a picosecond. So you know Goldy and he told you he’d do this? As much as I would hate for it to happen, Goldshmidt to the Yankees makes a ton of sense. Should they seriously consider trading Goldschmidt? Yes. Is it a good idea? Maybe, but I’m not so sure that the D’backs are in, or need to be in, full rebuild mode. Will they trade Goldschmidt? Unless they get bowled over by an offer, no, I don’t think so. There would be some serious backlash from the fans IMO, and unless Paul asks for a trade I can’t see Arizona doing it unless they really get a great offer. Wouldn’t there be the same backlash when he leaves in free agency a year from now? I think, if traded, the yanks make the most sense. Especially if they miss out on Machardo. They have a decent bit of money coming off the books and a need at first and As he gets older, the American League will suit him well. Also, with Corbin leaving, I can atleast see a Sheffield package..him and two lower tier prospects if they can get an extension for Goldsmicht. Yankees make the most sense..and if I’m Cashman, I’m thinking judge, stanton, Goldsmicht back to back and they have the money to sign corbin, who’s family are big Yankees fans. I really doubt the Yanks aren’t trading three prospects including there best prospect for Goldy who is 31yo and will be a free agent. He’s RH and coming off a so so year for him and now getting older! Again, if Goldy were willing to sign an extension the Dbacks wouldn’t trade him they would extend him. My guess is they hold onto him until July. That wasn’t a poll choice, so I had to vote no to the question as asked. Should be an option. But if the Dbacks cant get an extension on him now than they should move him this winter and get a larger return. Waiting until the season will diminish the return significantly. Dbacks wont be able to field a better team next season losing Corbin, Pollock, Escobar etc. nor can they financially afford to sign older free agents to replace them. Farm is weak. Hate to say it but you have to face the fact that its rebuild time. Goldy is a great player and a better person but their is NO way he takes a team friendly extension(again) to stay on a rebuilding team. Give the guy a shot at a World Series. And hey, If he isn’t extended by the new team the Dbacks can sign him a year from now as a FA. Extensions are like unicorns — discussed far more often than actually seen. You’ve also set out the case for why the D’backs should not even try to extend Goldschmidt. They are losing too many other major pieces to be competitive in the short to medium term, and as you say, the player isn’t going to sign a bel0w-market deal with Arizona or anybody else. After this disappointing season I can see them waiting on Goldschmidt until they get a better look at the competition in the division and to gage if they might be able to cobble together another chance before all the cornerstones are gone and they are forced into full tear-down mode. Bird, Ellsbury, and Gray to the Diamondbacks for Goldschmidt and Greinke? What about future Hall of Famer Rob Refsnyder? Can’t do it….Refsnyder’s going to LAA for Trout,…it’s already done, just waiting for the WS to end…..
Dude the Dbacks might need some salary relief but their not going to accept our cast-offs. I don’t think the Yanks should go after him at all but if they did I would think they’d want Voit plus maybe Sheffield OR one of German, Adams, Loisaiga + lower prospect. Bird has to rebuild his value. I sort of wish the poll was reworded (or a follow-up poll question would be included). The question asks if I *expect* them to trade Goldy (I do not), but I believe the DBacks *should* trade Goldy. In a sane world he would be a D-Back for life. 1 decent mid level prospect. Grienke going on 36 with untradeable contract. Alex Avila is a left handed bat and defense first catcher to help Sanchez and back him up. Bird and Voit can platoon at first and both young. Romine replaces Avila. Gray replaces Grienke. Prospect such as a Chance Adams or another pitching prospect to sweeten deal. Thats a nightmare deal for AZ – you Yankees fans need to learn how to do those kinds of posts, its not “my fave teams most worthless players for extremely good players” – AZ gets absolutely nothing out of that trade. From one Yankee fan, to another, Lol Billy. Note to JTO: Why is it hard so hard for you not to generalize entire fanbases’ based on individual posts? If the Yankees want 2 useful players (greinke may be overpaid, but he’s still useful), they’re gonna have to send more than the dead weight from their own roster. Can fetch 2 perennial all-stars AND a servicable catcher? I see the Cardinals as the best fit for Goldy. Could swap some of that SP depth for him and they could send Martinez too. Diamondbacks are not trading Goldy to a NL team. No way. as long as he goes away from the NL west . Devers for Goldy. Sign Machado to play 3rd. The ongoing delarussastewartification process might be a little painful. I have some concerns signing him at 30. He strikes out a lot. He has a nice average and obp, but his numbers are only heading one direction moving forward. Him or Hosmer, I would choose Goldschmidt. Makes too much sense for the Yankees to not Land him. They need a Good first basemen and the fact that Cashman and Steinbrenner and Goldschmidt all have one big thing in common by their last names,means he will end up in the Big Apple with Big Money !